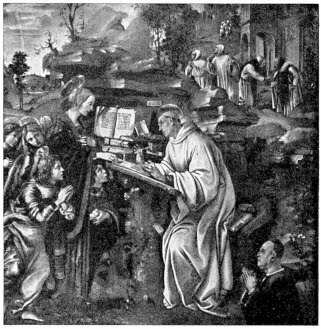 Today Holy Mother Church celebrates the feast day of St. Bernard of Clairvaux, Doctor of the Church and a widely known man in the 12th century. He felt called to the monastic life but rather than taking the easy way of simply becoming a general Benedictine, he had a lot to do with the beginnings of the order Cistercians of the Strict Observance, which started at the monastary of Citeaux in France. (In Latine, Citeaux is translated into Cistercium.) This movement within Benedictine monasticism, started by St. Bernard, gave birth centuries later to the Trappist movement. From the titles (“Cistercians of the Strict Observance, Trappist), we see that St. Bernard knew well that the life of faith demands rules and it demands a faithful following of them. St. Bernard was also one to encourage others to live in this kind of way, that is, in responding to the prompting of the Holy Spirit. And Bernard certainly welcomed others into the monastic life. Fr. Don shared that mothers and wives used to hide their sons and husbands when they heard St. Bernard was coming to town out of fear that he might take them with him and turning them into monks! But there’s something good here: Why go alone when you can bring others with you? Pope Pius VIII called St. Bernard the “Honey-Sweet Doctor” because of his eloquence and because he went all around Europe defending the faith. Because of this, he is the patron saint of bees and beekeepers. Such is the way Holy Mother Church assigns patronages! Fr. Don’s homily today focused largely on the reality that St. Bernard was a man who worked to change the popular-at-the-time image of “Christ the Judge” into one that revealed more compassion and mercy. His idea was that if we are indeed as the Bible and our faith tell us, made in the image of God, than so to was Jesus, the son of God. And our God is one of mercy and love! Father also talked about the ways in which St. Bernard was not always the pious and austere man that many believed him to be. He was indeed human, and Father Don read part of a letter written by St. Bernard that revealed him humor and his, shall we say, frustration and perhaps a touch of impatience. The name of the book he read from: “Letters from saints to sinners”. As Father Don said, the saints are infrequently as overly pious and near perfect as we oftentimes envision them. It’s something to be glad about, because there’s room enough for us all. ← Nun and monk gazing!